Citation Information: J Clin Invest. 2018;128(3):1178-1189. https://doi.org/10.1172/JCI97702. Lrp1 gene transcription negatively correlates with β cell function in B6:BTBR F2ob/ob mice. Pancreatic islets were isolated from individual 10-week-old, chow-fed B6:BTBR F2ob/ob mice (n = 491), prepared for RNA, and subjected to microarray analysis of gene expression. The Lrp1 mRNA level is correlated to fasting plasma glucose (A), triglyceride (B) and insulin (C). 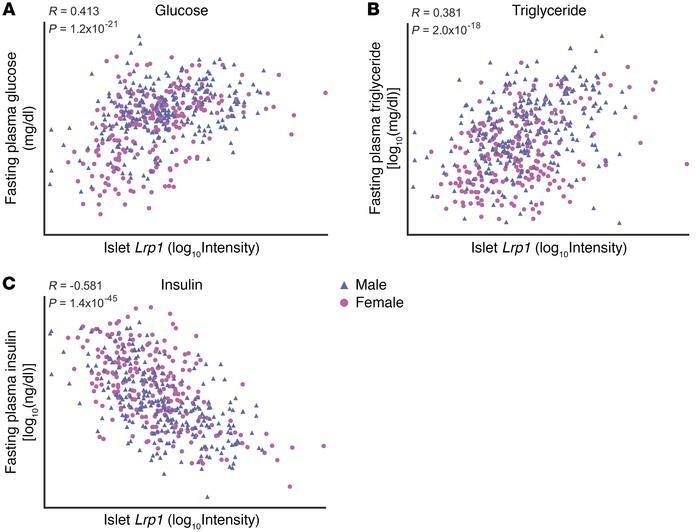 To approximate normal distribution, log10 transformation was applied to the expression values for Lrp1 as well as the measurements of triglyceride and insulin. Data normality was tested by Kolmogorov-Smirnov test with Lilliefors correction. Correlation coefficients R and P values were calculated by the Pearson product moment test.